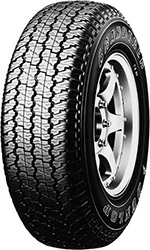 A perfomance SUV tyre designed like much of the Grandtrek range to create a hybrid between the off road demands expected from a 4x4 tyre and the on road qualities and comfort that the modern 4x4 and SUV owner demands. A new and improved all round block tread design and a staggered shoulder enable strong levels of traction in the most extreme conditions. The wide circumferential grooves add to the comfort when driving on the road, reducing noise emissions significantly and adding a smoother feel to the ride.